Computer programs work in two ways. There are certain computers that need to rely on another main computer, also known as the server, for its main applications and function. The computers which help in the operation of other computers and itself acts as the main server managing the major bulk of the workload is called fat or Thick client while the former is known as thin client. The thick client or server usually provides data persistence, actual information processing, etc. on the client’s behalf. Thick clients are basically an alternative to thin client computing. The thin client needs the processing power from the server and therefore cannot function on its own. It looks rather primitive and outdated in appearance unlike modern PCs. There isn't much hardware or software installed in a thin client. Thick clients on the other hand having its own storage, memory, processing, etc. can work on its own. IT technicians are required to maintain all systems for software deployment apart from merely maintaining applications on the server. Corporate laptops are often used as thick clients that are remotely connected to the internal network. 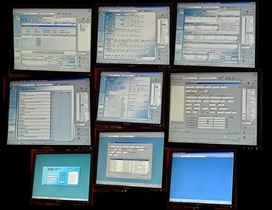 Computers can function individually running on their own applications as well. The environment for a thick and a thin client differs too. The applications to be run, the graphic required for each terminal and the scalability and portability need to be taken into consideration before choosing between a thick and thin client. 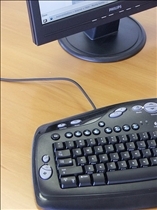 Thin client computers are generally installed in places where a large number of clients require access to the same information and thus are used in public environments. In airports, hotels, installing software in each computer would be impractical and thus thin clients are used. Maintenance would become a major problem otherwise. Both thick and thin clients have their own advantages and disadvantages and it basically depends on the situation and the kind of environment it is used in based on the need. Since fat or thick clients can work independently, the functioning is smooth as there is no load on the server. Software licensing costs are decreasing as a result of which thick clients seem to be becoming more popular. Thin clients need to accommodate quite a number of terminal machines, which is not required in thick client machines thus reducing costs. Thick clients pose more work and limitations for deployment and thus the need for specific applications is required for its operation unlike thin client machines. Thick clients have become more prevalent because of the drastically reduced rates as servers. It is much more cost-effective as compared to several thin clients. Thin clients cannot be completely done away with as it is still very useful in public places for providing access to a large number of people to some common data. Nowadays, the web thin clients depend on web based software for data storage and application. This does not give rise to the need for licensing like it was in case of most thin clients previously.